What are all these people looking at? Why are they standing around shivering on the Saturday after Thanksgiving? 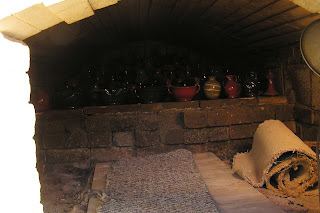 Under the green roof in the picture above sits a brick-domed wood kiln filled with pitchers and face jugs and other pottery by Traditions Pottery and Bolick Pottery. Most of the year, these two businesses sell their pottery through a shop in Blowing Rock, online, or to those tourists and locals who take the time to drive out to their workshop. Twice a year, however, they invite the public to their enclave where they live and make their wares. One event in June features pottery throwing demonstrations, music, and other fun. 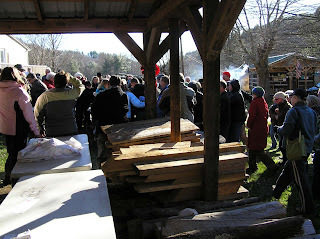 The Saturday after Thanksgiving, however, people come from miles around to have first pick of the work coming out of the wood-fired kiln. Yellow caution tape rings the area around the kiln, keeping the crowd at bay while the kiln is unloaded. First, however, there is a prayer asking the Lord's blessing on the day and on the work produced. 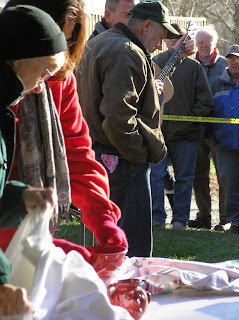 A man with a guitar sings a song. Then the unloading begins. The first few pieces are easily removed and handed out to the women waiting to give them a quick inspection for firing flaws or cracks. The women afix a price to the items and set the pieces on a large table in full view of the crowd. 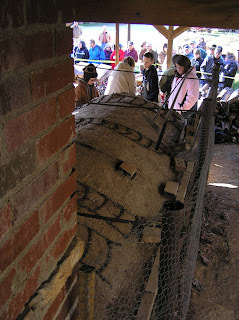 The kiln extends back about 1 6 feet or more, so after the first row is removed a young man -- not too big -- crawls inside to hand out the bulk of the load, many of which have been glazed with Christmas red. Dark blue is another common color. 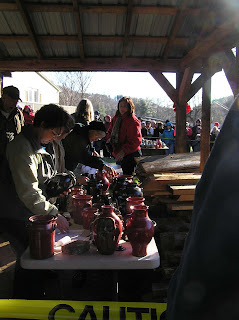 People in the crowd huddle together for warmth and pull their hats down over their ears as they watch the table fill with lidded crocks and graceful ewers. You can see people nudge each other and nod as particular pieces emerge and are added to the table. 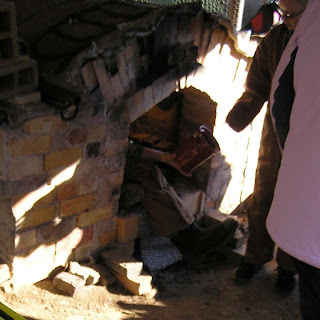 Once the kiln is emptied and all the items are priced and set on the table, the yellow tape comes down and the crowd rushes forward to claim their chosen items before someone else grabs them. There's some bantering about who had what first, but most seems good-natured and friendly. Sometimes, after the customer has inspected the item more closely or after they realize they've snatched up six items and only need five, some are returned to the table for someone else to take. Within twenty minutes or so, however, the table is empty. Then the crowd works its way down to the building where hot chocolate and goodies are being sold. Some of the pieces need to be smoothed on the bottoms, so the potters turn on their grinders and sanders and provide the finishing touches. The shops fill with people paying for their prizes and with others looking for items similar to those they wanted but didn't get. 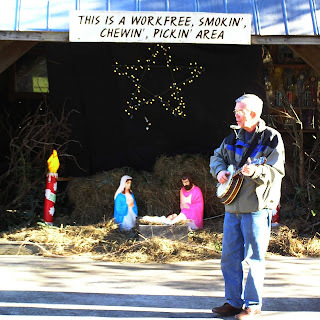 The man with the guitar moves to another gathering area in front of a manger scene and pulls out a banjo. A dog finds a sunny spot for a snooze and ignores the whole thing. Just a sign directing trucks where to turn in off of a road in an industrial warehouse area of Asheville, North Carolina. Cross the railroad tracks, dodge a pothole or two, and pull around back. Drive past the loading dock and park facing the French Broad River or facing the two-story white metal building. No further signs indicate that this is a shrine on at least one potter's pilgrimage. The St. Petersburg Clay Company, in St. Petersburg, Florida, has an on-site Highwater Clays store where I buy all my clay. Plus, I often run down there on my lunch hour to pick up clay for the Dunedin Fine Art Center and haul it up in the evening. But the clay I buy in St. Pete is already mixed, pugged, and bagged. I've read about the mixing process, but reading and seeing are two different things. 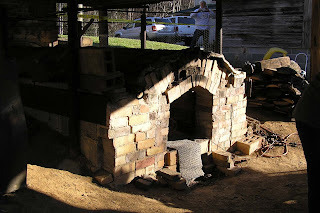 So when we drove to North Carolina for Thanksgiving last month, a side trip to the Highwater Clays plant in Asheville was high on my list of want-to-do's. And the nondescript warehouse building exterior didn't diminish my anticipation in the least when we drove up. Inside, we browsed among many of the same books, tools, and glazes as in St. Petersburg. There was a larger selection, to be sure, and a small gallery type display of area potters' works. But what I really wanted to see was behind the closed swinging doors leading to the main part of the warehouse where pallets of bags of dry clay were stacked pretty much floor to ceiling. 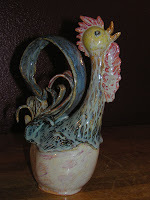 Thanks to Jennifer Hoolihan, ceramic technician at Highwater Clays, I got to do just that. Jennifer escorted the four of us -- my wife, my brother, and his wife -- through the swinging doors and answered our questions about how they put out as many as 32,000 to 35,000 pounds of clay a day using a gigantic, retrofitted, computer-controlled cement mixer to transform raw materials mined from Ohio, Missouri, Florida, Georgia, Tennessee, North Carolina, and Virginia into clays ranging from fine porcelain to coarser raku. It's always good to know where things come from--and to know that a plain, white warehouse can churn out a whole world of creative possibilities. Look for our booth at St. Petersburg's Boyd Hill Nature Preserve this Saturday and Sunday. We'll be part of the Art Arbor Festival, open from 10 a.m. to 5 p.m. on the grounds of this 245-acre preserve. 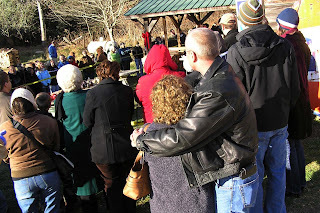 Enjoy live music and other entertainment, take a tram tour of the park, and view the wildlife exhibits -- in between wandering from artist's booth to artist's booth and doing a little holiday shopping, of course. There are always food vendors at these events, and the park is lovely with lots of trees and thoughtful plantings. Come make a day of it. Two days, if you like! Kids can get their faces painted, play games, or create art of their own to take home. 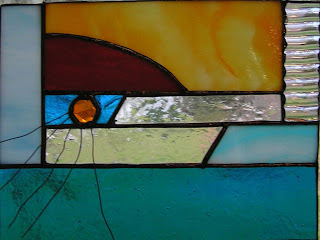 We'll be near our good friend Pam Beyersdorf, a stained glass artist from Largo. Pam creates one-of-a-kind kaleidoscopes and free-form glass art hangings, boxes, and candle holders. We'll have works in various stages of completion so you can see how my pottery goes from a lump of clay to one of my Pegasus series pieces. I'll also have some of my naked resist work and some fired with other types of glazes, as well. Plus, it's for a good cause. The suggested donation of $2 per person goes to the non-profit organization that supports the park. No pets, except service dogs. Boyd Hill Nature Preserve is located at 1101 Country Club Way S. in St. Petersburg, at the south end of Lake Maggiore. Take I-275 south to 54th Ave. S. (exit 17), go east on 54th Ave. S. to 9th St. S./Dr. Martin Luther King, Jr. St. S., and turn left. Go four blocks to Country Club Way S. and turn left again. From these stories and etymologies, comes our use of the word ‘pegasus’ today to speak of artistic inspiration. For me, that means knowing that the Source of all creation places His creative springs within us that well up and overflow . . . and that He occasionally zaps us with a bolt of lightning, as well. 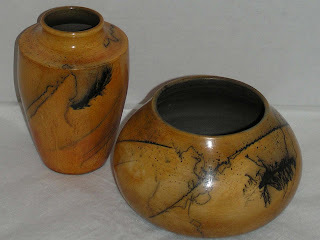 As I learned about raku firing -- the modern, Westernized version, that is -- I began experimenting with applying horsehair to burnished pots, bisque fired and then reheated to about 1100 degrees. I started scrounging for other items that would leave enough of a carbon trace design, and found that feathers worked well. 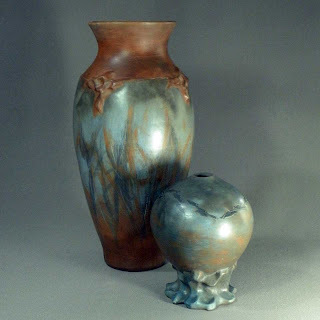 These three pots in my Pegasus series earned second place in the Student division of the Dunedin Fine Art Center's 2008 Summa and Magma: Student and Member Exhibition. For a piece commissioned for a fly-fisherman friend, I used turkey feathers from my fly-tying days. But mostly I scan the ground for random feathers, fallen from some flying creature passing overhead. Why shouldn't they be from an equine creature as easily as from an avian one? Two works by Jennifer Weaver, my teacher at the Dunedin Fine Art Center. Much of Jennifer's work is saggar-fired, in which the pottery is wrapped with all sorts of organic materials and placed inside a can or another pot or even loose tin foil before firing. The gases produced create different effects. Lee with his teacher, Jennifer Weaver, at the Dunedin Fine Art Center's Student/Faculty/Members Show this past spring. For a time, I had a Saturday morning appointment with a virtual friend. I'd get up early, go for coffee, read the newspaper, and be home before 9. Then I'd settle into my spot on the couch, click the remote, and find our local PBS station. And there she'd be -- still is, for that matter. Donna Dewberry, creator of One-Stroke Painting. I watched, mesmerized by the ease with which flowers and critters flowed from her brush. During one PBS share-a-thon, we sent enough of a donation to get her video set. I bought brushes and paints and played with mixing colors and practiced pushing and lifting to create leaves and petals. Before long, I was watching Terry Madden, a watercolor artist whose show aired right after Donna's. Finally, my wife gave me a gift certificate to the Dunedin Fine Art Center. Took me a while before I got around to using it. Tried a sumi-e class first (not through the center) and then a blacksmithing class at Pinellas County's Heritage Village. Shortly after completing the blacksmithing class -- and setting up my own anvil and forge at home -- we did a lunch-and-library date where I checked out a few books on blacksmithing. Then we stopped by the Dunedin Fine Art Center where I planned to finally use my gift certificate and sign up for a watercolor or drawing class. The main exhibit hall, however, held a ceramics exhibit full of funky clay sculptures. Not exactly my style, but it looked interesting. And the clay class was a better fit for my schedule. I filled out the papers, gave them my gift certificate, and we went home. I opened up on e of the library books I had checked out . . . and read that serious metal workers should learn to work in clay first. And then I went to my first clay class and touched the clay. And knew. I spent most of that first two-hour period just squeezing it and feeling how it responded. Thankfully, my instructor, Jennifer S. Weaver, understands that each person in her class needs to find his or her own way into clay. Jennifer demonstrates pinch pots, coil work, slab work, throwing pots on the wheel, and different glaze applications. Some stud ents try a little bit of everything. Others try variations of just one technique. Either way is OK with Jennifer. She'll offer just as much instruction and advice as a person can absorb at one time, and then she'll step back and let us try it for ourselves. That's just the kind of teacher I needed. That one class I signed up for became two classes the next session, and for every session since then. And I've learned something new each time. Want to come play with clay and learn from Jennifer Weaver? She teaches Wednesday and Thursday evenings from 6:30 to 9 p.m. at the Dunedin Fine Art Center. The 17th Annual Studio Waltz takes place this Saturday, October 10, from 9 a.m. to 5 p.m. Download a map from the Web site and see representative works from the artists opening their studios to the public. On Saturday, waltz your way from north Clearwater to Tarpon Springs as you visit fiber artists, photographers, painters, potters, and other artists. One group of plein air artists will set up their easels along the Pinellas Trail at Main Street in Dunedin. Artists' work will be for sale. And, yes! Lee will be sharing his work at the home studio of Jennifer Weaver (#10 on the tour), Lee's instructor at the Dunedin Fine Art Center.